Department of Health confirmed three dead because of meningococcemia nearby Tagoloan, Misamis Occidental. One of them is the grade one pupil, an uncle of the said victim and a child who were infected with the said bacteria. Base on the statement of the authorities, the pupil immediately buried after the physician advised. But the following day his uncle died also because of meningococcemia. And the other victim has admitted also in the hospital because of the high fever, but unfortunately, it was confirmed that he had been infected also with the bacteria. The Department of Health ordered to disinfect the classrooms of the said victim so that bacteria will stop from spreading among the other students. 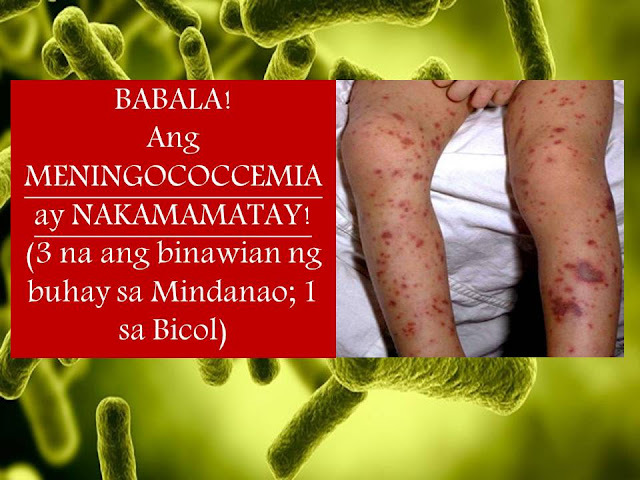 In Bicol Region, a four year old boy also died because of meningococcemia in the province of Albay. According to DOH-Bicol, there are 13 cases of meningococcemia in the said province. They also are given antibiotics to those who had contacts with the victims. It's better to be safe than to say sorry in having the bacteria.